Lady Jane Seymour (1507/1508–October 24, 1537), was a queen of England and the third wife of Henry VIII, who bore him the son and heir he so ardently desired in Edward VI. Henry courted her while still married to Anne Boleyn. She became betrothed to Henry just one day after the execution of Anne. They were married ten days later on May 30, 1536. A more conservative character than her predecessor as queen, she devoted herself to obedience to Henry and bearing him a male heir. Although she achieved her aim, she died of post-natal complications following the birth Edward VI, her only child. After her death she was remembered with respect and honor for producing an heir to England's throne. Edward did not reign long, however, and was succeeded by his half-sisters, Mary and Elizabeth. Lady Jane's role in recent years has been much debated, with some seeing her as a model of grace and humility, and others suspecting that she conspired quietly but ruthlessly do away with her rival, Anne Boleyn. Jane Seymour was the daughter of Sir John Seymour of Wiltshire and Margaret Wentworth. She was King Henry VIII's fifth cousin three times removed, and her family was of ancient and respectable lineage. Jane's father served with Henry VIII in the Tournai campaign of 1513 and was a participant in the Field of the Cloth of Gold in France in 1520. He received several desirable positions, including knight of the body and later gentleman of the king's bedchamber. This personal closeness to the king allowed Sir John access to the "king's ear." Sir John thus secured appointments at court for his family. Out of eight children, three gained prominence. His eldest son, Edward, became duke of Somerset and lord protector for young King Edward VI. Another son, Thomas, became lord admiral and later husband to Catherine Parr, Henry VIII's last wife, after the king's death. Jane became queen. Seymour's rise to prominence at Henry's court mirrored that of the Boleyns. It was the path sought by many English families with a minor pedigree or a clever son. But gaining the king's favor was different than maintaining it, and the Seymours proved far more adept at it than the Boleyns. Jane's exact birth date is debated; it is usually given as 1509. However, it has been noted that at her funeral, 29 women walked in succession  Since it was customary for the attendant company to mark every year of the deceased's life, this implies she was born in 1508. She was not educated as highly as Catherine of Aragon or Anne Boleyn, but she was able to read and could write her name. Like many women of her age, Jane was taught needlework and household management. She became a lady-in-waiting in 1530, at age 21 or 22, in the last year of Catherine of Aragon's reign. After Henry divorced Catherine and Anne Boleyn became queen, she served Anne in the same office. Jane witnessed first-hand the tempestuous relationship between Anne and Henry. She herself was known for her quiet and soothing manner. Certainly Henry knew of her, but there is no evidence that he took particular notice until September 1535, when his royal progress stopped at Wolf Hall in Wiltshire. Such a visit was a great honor for the Seymour family. It also brought Jane, away from court and its many flirtatious young beauties, to the king's immediate attention. However, Henry apparently did not show much interest at this time, as he was involved with Anne Boleyn's cousin Madge Shelton. 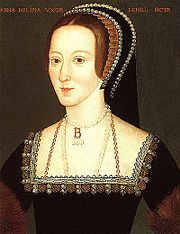 Henry's love for Jane was not evidenced until February of the following year when his marriage to Anne was falling rapidly apart and his first wife, Catherine of Aragon, had died in January. His desire to marry Jane may have predisposed him to believe the accusations of adultery and witchcraft against Anne which were used to bring about Anne's doom. In February 1536, foreign ambassadors began to report rumors of the king's romance with Jane, and they speculated about Jane becoming queen. Henry made his affection clear to Jane. She received costly gifts (which she prudently returned) and her brothers were promoted at court, a sign of the king's favor. In April 1536, Jane's brother Edward Seymour and his wife moved to rooms which connected through a hidden passage to the king's apartments. Henry could thus continue his courtship of Jane in relative privacy. The king was far more discreet with Jane than he had been with Anne when she was his mistress, which undoubtedly suited Jane's character. She was content to remain unknown while the queen fell out of favor. There were reports that Jane would not dine alone with the king, insisting always upon a chaperon, and that she responded to a particularly bold flirtation by reminding the king of his marriage. Jane would not need to keep the king at bay long, however. Henry became betrothed to her on May 20, 1536, the day after Anne's execution, when he was 45 and she 27 or 28. They were married on May 30. Jane was publicly proclaimed queen on June 4. She chose an apt motto, "Bound to Obey and Serve." Jane was never officially crowned, however, reportedly due to a plague epidemic in London where the coronation was to take place. It has also been suggested that Henry was reluctant to crown her before she had fulfilled her duty to bear him a son and thus a male heir. It had been nearly a decade since the King's "Great Matter" (his divorce of Catherine of Aragon) first began. And on July 20, 1536, he received the devastating news that his only known illegitimate son, Henry Fitzroy, Duke of Richmond, had died at the age of 17. This removed the possibility that Fitzroy could have succeeded him. It is virtually certain that if Jane had not provided a son, she would eventually have been discarded, regardless of the king's affections. As queen consort, Jane was strict and formal. She was close only to her female relations, Anne Stanhope (her brother's wife) and her sister, Elizabeth Seymour. The glittering social life and extravagance of the queen's household, which had reached its peak during the time of Anne Boleyn, was replaced by a strict enforcement of decorum in Jane's time. Dress requirements for ladies of the court were detailed down to the number of pearls that were to be sewn into each lady's skirt, and the French fashions introduced by Anne Boleyn were banned. Jane also appears to have been conservative politically. However, her only involvement in national affairs, when she asked for pardons for participants in the Pilgrimage of Grace rebellion in 1536, was abandoned after the King reminded her of the fate the other queens met with when they "meddled in his affairs." 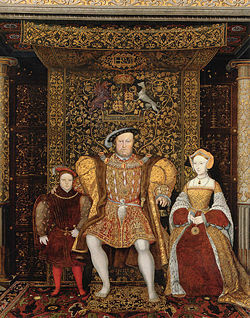 Detail of the "Family of Henry VIII," painted anachronistically and featuring Jane Seymour and Edward VI with Henry VIII. In early 1537, Jane finally became pregnant. Bonfires were lit and celebrations held throughout England; prayers were offered for a safe delivery. During her pregnancy, she developed a craving for quail, which the king ordered for her from Calais and Flanders. In early October, Jane went to Hampton Court Palace for her lying-in. On October 12, after a long and difficult labor, she gave birth to the much wished-for son. It was the eve of St. Edward's day and so he was baptized by that name on October 15. His two half-sisters, Mary and Elizabeth, attended the splendid christening ceremony. 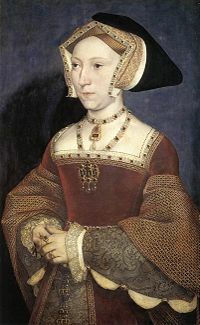 Mary, the daughter of Catherine of Aragon, stood as godmother; Elizabeth, the daughter of Anne Boleyn, was carried in the arms of Thomas Seymour, Jane's brother. Elizabeth's grandfather, Thomas Boleyn, also attended the ceremony, despite his daughter's fall from grace. Past grievances could be forgotten at this grand moment. Sadly, after she participated in the prince's christening it became clear that Jane was seriously ill. She had contracted puerperal fever and died on October 24 at Hampton Court, living only 12 days after giving birth. There were rumors that she died from complications of a cesarean birth. However, if that were true, she would probably have died much sooner, since mothers rarely lived long after such operations. The world at once ne'er knew two such. After Jane's death, Henry wore black and did not remarry for three years. This was the longest period between marriages for the king, and he apparently always remembered her with affection. Historians have speculated that it was Jane's achievement of securing Henry a male heir that made her so fondly remembered by him—either that, or her dying before he had tired of her. When he died in 1547, Henry was buried beside her. Jane's memory lives on as a lady who fulfilled her royal responsibility by producing an heir. She achieved this goal with a quiet dignity so unlike the tales of her predecessors. Her family legacy, however, was not a happy one. Her son, Edward VI, (October 12, 1537 – July 6, 1553) became king of England and Ireland on January 28, 1547, and was crowned on February 20, at just nine years-of-age. Although Henry VIII had already severed the link between the English church and Rome, it was during Edward's reign that Protestantism was fully established for the first time in England, with Thomas Cranmer, the Archbishop of Canterbury, implementing the Book of Common Prayer. Edward's reign was marked by increasingly harsh Protestant reforms, the loss of control of any part of Scotland, and an economic downturn. Social unrest intensified during his rule, and conflicts with the French increased. Jane's two ambitious brothers, Thomas and Edward, used her memory to improve their own fortunes. 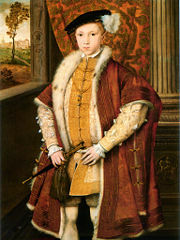 In the reign of the young King Edward VI, Edward Seymour set himself up as his lord protector and effective ruler of the kingdom. The young king died at the age of 15 at Greenwich Palace on July 6, 1553. The definite cause of his death is unknown: suggestions include tuberculosis, arsenic poisoning, syphilis, or rheumatoid arthritis. His last words were said to have been: "Oh my Lord God, defend this realm from papistry and maintain Thy true religion." Jane's other brother, Thomas Seymour, married Henry VIII's widow, Catherine Parr, with whom he had a previous affection, but he also had designs on the future Queen Elizabeth I. Thomas was thought to be jealous of Edward Seymour's power and was rumored to be scheming to replace him as lord protector, or even to kidnap Edward VI himself. On February 22, the privy council officially accused Thomas of 33 charges of treason. He was executed on March 20, dying "dangerously, irksomely, and horribly." His daughter by Catherine Parr, Mary Seymour, was left penniless and disappeared from the historical record. Soon after his brother's death, Edward Seymour also fell from power. His position as duke of Somerset and protector of the realm went to John Dudley, later 1st Earl of Northumberland. Jane was widely praised as "the fairest, the discreetest, and the most meritorious of all Henry VIII's wives" in the centuries after her passing away. Victorian scholar Agnes Strickland, however, took the view that the story of "Anne Boleyn's last agonized hours" together with Henry VIII's swift remarriage to Jane Seymour "is repulsive enough, but it becomes tenfold more abhorrent when the woman who caused the whole tragedy is loaded with panegyric." Other more contemporary writers, particularly Alison Weir and Antonia Fraser, paint a favorable portrait of a woman of discretion and good sense—"a strong-minded matriarch in the making," says Weir. Hester W. Chapman and Eric Ives, on the other hand, resurrected Strickland's view and believe Jane played a crucial and conscious role in the cold-blooded plot to bring Anne Boleyn to the executioner's block. ↑ Alison Weir, The Six Wives of Henry VIII. ↑ Ballads on the death of Jane Seymour after the birth of King Edward VI www.sacred-texts.com Retrieved May 9, 2008. ↑ A lofty oration or writing in praise of a person or thing; eulogy. www.dictionary.com Retrieved May 9, 2008. PBS handbook on "The Six Wives of Henry VIII: Jane Seymour 1508-1537". PBS. Retrieved May 24, 2008.